The slowdown in investment in oil and gas production could lop off nearly 8 million barrels a day of future oil supply growth, setting the stage for another big crude price spike in the years to come, according to a new study. The global credit crisis and falling oil prices have squeezed oil companies' finances and forced many of them to cut capital spending and postpone projects. That could have big implications for supply when the global recession ends and demand for energy recovers, the report by Cambridge Energy Research Associates says. Leaders of cash-strapped Santa Rosa on Tuesday gave police officers and firefighters a standing ovation after their unions agreed to forgo pay raises totaling more than $4 million over the next two years. But could this politically backed, popularly supported solar surge spiral into eco-disaster? That's what some say is happening to the Carrisa Plains, a sparsely populated swath of arid, sunny and relatively cheap land in eastern San Luis Obispo County, where three of the world's largest solar plants ever proposed are under review. Together, the Topaz Solar Farm, California Valley Solar Ranch (both photovoltaic projects) and the Carrizo Energy Solar Farm (a solar thermal operation) would provide energy to nearly 100,000 Golden State homes, but only by covering roughly 16 sq. mi. (41 sq km) of the ecologically sensitive plains with solar panels and industrial development. All three plants have deals with Pacific gas & Electric (PG&E) (which declined to comment for this story), and all want to start construction by the 2010 deadline for federal funds. And more solar-plant proposals are on the way, in large part because transmission lines with available capacity already run through the region. When Are We Going To Start Talking About The Environmental Cost Of Solar? Yet nobody seems to ask the question, Where are we going to get 10,000 or 20,000 square miles of desert to do all this? The assumption – much like that of the early American pioneers – is that there are vast tracts of land somewhere out there in the West waiting to be put to our use. Has anybody ever heard the term “environmental impact?” Is it even conceivable that you can mark off this much land on the map and not come across some endangered species? Here’s another consideration that you never hear about. One of the biggest problems with solar mirrors and photovoltaic panels is they get covered with dust and grim and lose much of their effectiveness. They have to be washed off frequently. Where, in the middle of the desert, do you find enough water to wash down 10,000 square miles of solar collectors at least once a month? The multiple pathways shown in Figure 2 illustrate what Chu calls a “portfolio” approach to creating 4th generation biofuels. I prefer to describe it as a “scattershot” approach in which you randomly fire a lot of bullets in some general direction and hope you hit something. In what general direction does Chu want to shoot his bullets? Chu wants nothing less than to alter the Earth’s primary productivity, its energy flows, to achieve greater efficiency in the conversion of sunlight to chemical energy than Nature has after 3.5 billion years of evolution. . . This suggests that tampering with plant productivity may be a grave mistake or impossible. I do grant the possibility that constraints on primary production were the result of an “accident” (mere chance) in the way life evolved on Earth. In this case plant engineering might well be possible. How are we to assess the likelihood of either position? We can’t. We do know that 4th generation biofuels will require the creation of artificial ecosystems, i.e. systems which have been human-designed and -engineered for specific purposes. The global financial crisis and collapse in the oil market have stalled vital investment in oil exploration and production and are likely soon to lead to a sharp spike in prices, an energy consultant and financier says. Matt Simmons, founder of Houston-based investment bank Simmons & Co, argues the underlying rate of decline of the world's aging oilfields is as much as 20 percent a year and only high levels of investment can reduce that to single digits. "We are three, six, maybe nine months away from a price shock. We are not talking about three to five years away -- it will be much sooner," Simmons told Reuters in London. "These prices now are dangerously low. The lower prices fall, the less oil will be produced and the greater the chance of an oil spike," he said. StatoilHydro has struck oil during the drilling of an exploration well and a sidetrack north of the Vigdis East field in the North Sea. The proven recoverable resources are estimated at about 25 million barrels of oil. The well confirmed the existence of a 280-meter oil column in rocks with good reservoir properties. "Our exploration activities close to fields on stream are successful and the discovery again confirms that there is still a great potential in this part of the North Sea," said Tom Dreyer, StatoilHydro's vice president, infrastructure-led exploration, North Sea. BHP Billiton announced that first oil and natural gas production has commenced from the Shenzi development in the deepwater Gulf of Mexico. The tension leg platform (TLP) has a nominal capacity of 100,000 barrels of oil per day and 50 million cubic feet per day of natural gas, on a 100 percent basis. The Shenzi facility is located approximately 120 miles (195 kilometers) off the Louisiana coastline and is installed in approximately 4,300 feet (1,300 meters) of water on Green Canyon Block 653, making it the second deepest TLP in the world. Brazil's President Luiz Lula da Silva, apparently reversing earlier decisions, said his government is again considering an invitation to join the Organization of Petroleum Exporting Countries. "Very, very soon Brazil is going to participate in OPEC," said the Brazilian president, according to Argentina's Empresas News. If correct, the statement would reverse earlier remarks by Lula, who last year said he preferred Brazil to export refined products, not crude. The Brazilian president's remarks follow a Mar. 23 statement by Mines and Energy Minister Edison Lobao, who said the country was officially invited to join OPEC last week, but that it should enter the organization only when it effectively becomes an oil exporter. By way of alarming comparison, this six-month drop is a bit faster than the six-month fall at the beginning of the Depression, when trade fell from $920 million in October '29 to $640 million by April of 1930: i.e., 30.4 percent. In May, the Congress added the Smoot-Hawley Act and foreign tariff retaliation to the effects of deflation and falling demand. Trade totals then fell by another 72 percent over the next three years, bottoming out at $184 million in February 1933. Production cuts from the OPEC oil cartel stabilized oil prices and put $60-per-barrel oil within reach despite falling demand, the Algerian oil minister said. Production cuts of 2.2 million barrels today enacted in January by the Organization of Petroleum Exporting Countries have stabilized oil prices in the world market. Prices hovered at around $45 since late last year but have spiked more than $50 in recent trading. Algerian Oil Minister Chakib Khelil said that despite an estimated 1.1 million-barrel-per-day drop in demand, oil prices could reach $60 by the end of 2009, the Platts news service reports. Congress today set aside more than 2 million acres in nine states as protected wilderness; from California's Sierra Nevada mountains to the Jefferson National Forest in Virginia. The legislation is on its way to President Barack Obama for his likely signature. . .
Representative Doc Hastings and other Republicans complained that the measure would lock up millions of acres of land that could be explored for energy and used for other development. "Our nation can't afford to shut down the creation of jobs for jobless Americans, and we can't afford to become even more dependent on foreign sources of energy," Hastings said. The bill "even locks up federal lands from renewable energy production, including wind and solar," he said. China will encourage its energy companies to make more forays abroad to ensure the country's energy security, an even more important strategy than exploration at home, a senior energy official said today. . .
Liu also said China will offer more tax and other policy incentives to oil and gas companies to explore abroad. He did not elaborate, but state media have said low-interest loans and capital injections could go to oil giants China National Petroleum Corporation (CNPC), Sinopec and China National Offshore Oil Corporation (CNOOC), that aim to expand overseas as the global recession lowers the share prices of possible targets. Calgary-based EnCana and US supermajor ConocoPhillips are asking regulators to approve a 120,000 barrel per day expansion of the Christina Lake oil sands project, according to documents filed with Alberta Environment. Carol Howes, a spokeswoman for EnCana said no capital estimate has been given for the expansion project and filing for regulatory approval does not mean construction will soon begin. "This just confirms the scope of the project," she said. "This is just setting the stage for the potential expansions, subject to prices and capital expenditure (decisions)." The Colorado Legislature has given final approval to new regulations for oil and gas drilling, despite dire warnings from opponents that the rules will hobble an ailing industry and eliminate jobs amid a deep recession. Backers say the new rules are similar to ones already in effect elsewhere and will bring long-overdue protections to the public, the environment and wildlife. . . The rules give more weight to public health and safety, environmental protection and wildlife habitat and migration when state regulators consider applications for new oil and gas wells. The Obama administration's push to raise taxes on the oil industry is reigniting a battle the industry fought and won last year. Under pressure to narrow projected deficits, President Barack Obama's 2010 budget proposal calls for raising more than $31 billion over the next decade by eliminating the oil and gas industry's eligibility for various tax breaks. The plan would slap companies with a new excise tax on production in the Gulf of Mexico worth $5.3 billion between 2010 and 2019, and repeal the industry's eligibility for a manufacturing tax credit worth $13.3 billion in that period. The industry says the final cost of Mr. Obama's proposals on petroleum production could top $400 billion, once his plan to put a price on greenhouse-gas emissions is factored in. U.S. Interior Secretary Ken Salazar expressed flexibility on scaling back an Obama administration proposal for $31.5 billion in new revenue from the oil and gas industry. "We're willing to listen," Salazar said in an interview on Wednesday with Dow Jones Newswires. "If it is going to have a disproportionate impact on a mom-and-pop kind of operation I do think that's something that should be taken into consideration." Small, independent producers have warned about two tax breaks in particular that the Obama administration has proposed repealing: one that allows firms to write-off intangible drilling costs such as renting rigs, and another allows companies to take the depleting value of oil and gas reserves off their tax bills. Repealing both of these, says head of the Stripper Well Association Dewey Bartlett, Jr., cuts so drastically into the slim profit margins his members make, that the impact will be immediate. He says not only will the small firms not drill more wells, but if any well parts break, they're a lot less likely to be replaced. Advocates for alternative energy are discovering that water issues may prove to be as important a selling point for the industry as reducing carbon-dioxide emissions. "The more we wean energy companies off consumptive use of water, the better for everyone," said Craig Cox, executive director of the Interwest Energy Alliance, a Colorado trade group that represents power-project developers. The electric-power industry accounts for nearly half of all water withdrawals in the U.S., with agricultural irrigation coming in a distant second at about 35%. Even though most of the water used by the power sector eventually is returned to waterways or the ground, 2% to 3% is lost through evaporation, amounting to 1.6 trillion to 1.7 trillion gallons a year that might otherwise enhance fisheries or recharge aquifers, according to a Department of Energy study. The study concluded that a megawatt hour of electricity produced by a wind turbine can save 200 to 600 gallons of water compared with the amount required by a modern gas-fired power plant to make that same amount. . .
Nuclear plants face particular scrutiny, since they require more water than any other form of steam generation. The most obvious fact about ecological economics is that, well, ecology comes before economics. "For example," says Joshua Farley, an economist at the University of Vermont, "without healthy ecosystems to regulate climate and rainfall and provide habitat for pollinators, agriculture would collapse." Which makes it tough to sell cars. Put another way, "we need economic production to survive, but we also need healthy ecosystems and the service they provide," he says. No bees, no food, no trip to the grocery store. This hierarchy of logic might seem self-evident, but to ecological economists — like Farley and graduate student Rachael Beddoe and their colleagues at UVM's Gund Institute for Ecological Economics — the mainstream of economic thought seems to have the formula backward. Get the economy growing again, the conventional argument goes, then we'll have the time and resources to take care of the environment; let the market set a price tag on conservation and the ecosystems will take care of themselves. The step-in cost seems pretty low when there is a line already in place. Only one train per day each way for each destination is a pretty thin service, though. I hope that goes up! How does the cost and travel time compare to driving, I wonder? NC also funds intrastate intercity passenger rail service. It looks like we've got the first few building blocks for a regional network of intercity passenger rail links. I my dreams I see all of the cities between DC and Atlanta linked in a web of intercity passenger links. With the cause of a rampantly deadly bat illness still unknown, biologists have no solution to the problem but have proposed at least a quick fix that may be able to slow it down. At least half a million bats throughout the northeast United States have died from white-nose syndrome (WNS), a fungal infection that was first observed only two years ago. This disease has such a high mortality rate that it might be impossible for the bats to ever evolve an immune response to this problem. MANCHESTER — The state's leading bat biologist updated area residents Tuesday on white-nose syndrome, a mysterious disease that is devastating bat populations in the Northeast and beyond, and his report was grim. ..On March 16, scientists confirmed that the disease, first found in New York two years ago and, last year, in Vermont, Massachusetts and Connecticut, has spread to New Hampshire, Pennsylvania, New Jersey, West Virginia and possibly Virginia. "Its spread is rapid," Darling said, especially since bats travel far during the summer months, interacting with a large number of others. In October, experts identified a new species of fungus, Geomyces genus, that might be linked to the syndrome. However, there is still no way to stop it from spreading and no one has figured out a cause. As posted before: IMO, bat research into this problem needs to be massively funded. Recall my earlier weblink where some scientists think General Motors needs to start building millions of bat shelters that are warmed by a PV panel and car battery. Have you hugged your bag of NPK today? To echo Gail's toplink in today's DB: It is the ecology, stupid! Thxs for responding. If I was 0bama: I would immediately make it illegal to go spelunking to help protect the bats. Until they figure out the true cause, we should be doing everything possible to help reduce bat death rates. Same with bee Colony Collapse Disorder [CCD]. Recall my earlier post on how vanilla is almost entirely hand-pollinated now. We should be thankful that this is only a spice, therefore small multi-thousands [millions?] of tons are annually required. Not so if the bee & bat problems drastically reduce harvest yields on wheat, apples, citrus, etc. Thus, we increasingly run the risk of having a potentially great growing season, but could massive shortfalls due to insufficient pollination and/or bug swarms eating massive amounts. I worry greatly that this will escalate as other ecologic and specie problems are discovered; we may be seeing early signs of Nature's subtle version of nuclear bombs. Paraphrased from the DB article above: people won't be interested in buying any vehicle, tv, video game, etc, if massive food shortages kick in. ROME, March 19 (Reuters) - Setting up a world grain reserve is a realistic option that would reduce the risk of food shortages and shield farmers from big price shocks, a senior official with the U.S. National Farmers Union said on Thursday. The loss of bats would be just a additional stress against the human population. Only time will tell if it's the one that in combination with the others that results in us falling off the edge of survival. I think many spelunking organizations are already self regulating, not allowing/approving bat caves. Some actually fund fencing and locking of these caves. Vanilla is only hand-pollinated because its has been planted all around the tropics as a cash crop, while its natural pollinator is a small bee that only exists in Mexico. Nothing to do with bats or decline in pollinators, although the result is the same. Mao Zedong, decided that sparrows were a pest to crops, so had a national campaign to get rid of them. Peasants who destroy nests, scare and kill birds (even if they weren't sparrows). The next year, the crops failed quite badly, as they got swarmed by locusts. Weakened immune systems from low level pesticide toxicity, inbreeding depression from reduced population size & increased distance between colonies reducing outbreeding, habitat loss & hibernation disruption by researchers & spelunkers drawing down energy (fat) stores, evolution of pathogens for increased virulence in the face of population & environmental changes, mortality from wind turbines.. a perfect combination of stressors driving down bat populations towards extinction. As AGW increases the range of mosquito vectors of human disease northward, people are going to wish there were more bats. Electric trains & toothbrushes powered by the wind will be cold comfort to those suffering from West Nile virus or malarial infection. "without healthy ecosystems to regulate climate and rainfall and provide habitat for pollinators, agriculture would collapse." Stop spamming the board please. Rather than resort to cogent counter-argumentation, some posters stoop to spamming & stalking those they disagree with. It's a common practice on internet fora, when one's case is weaker &/or one is less articulate than their rhetorical "opponent." On moderated fora, whether such practice is tolerated is up to TPTB. I was just pointing out it was spam in hopes that tptb here tell him to stop. I happen to like that cartoon, and it is the most coherent and relevant reply I have yet found to the "Wind Turbines Kill Birds and Bats" argument that darwinsdog insists on posting in almost every Drumbeat. It is very compact, I only post it once per Drumbeat, and only in response to those posts. If that is what passes for spamming in this day, then the Internet is truly doomed. I liked it too.. the first time I saw it. I think the same about your birds and bats argument. Otherwise I find myself in general agreement with you, I just think that you are going overboard on that one. My point having been made, I shall stop posting links to it now. ...and Carthage must be destroyed! I am going overboard on it, you're right. It's not my major concern by a long shot. I'm far more concerned about the impact of dams & hydroelectric generation on lotic & riparian ecosystems than I am about avian & chiropteran mortality from wind turbines. (I'm an ichthyologist, after all, not an ornithologist or mammalologist.) It's the cognitive dissonance from advocates of alt tech who consider themselves to be "greener than thou" evoked by having it pointed out that their pet alt green majik BBs aren't so green after all, that motivates me to keep picking at this particular wound. It amuses me to see all the reactionary protestations - such as yours - to my offerings of simple truth, logic & morality, on the subject of wind turbines. Just admit that turbines do kill birds & bats, that populations in decline don't need additional stressors on them, and that two wrongs don't make a right. If you want to contribute suggest how turbines can be designed so that they don't kill birds & bats, or where they should be situated so as to mitigate mortality, or what else can be done to assuage pressure on populations of flying vertebrates in compensation for turbine mortality. Posting the same cartoon, no matter how funny it was the first time we saw it, doesn't contribute anything of value to the discussion. All the things you ask for have been posted by others, and then some. My contribution was to point out the continual repetition of the argument, as efficiently as possible and with a small amount of humor so as not to be too stinging. In my opinion every KW of wind power that replaces a KW of fossil fuel power is a win for all flying creatures, due to the effects of pollution on the air that their supercharged lungs need to process. I also support well monitored nuclear, some hydro power, solar, and good old-fashioned elbow grease as power sources. I might just be a quaint treehugger that way, though. In my opinion every KW of wind power that replaces a KW of fossil fuel power.. When has this ever happened? Has a FF burning power plant ever been decommissioned due to a wind farm being built? If wind generation was replacing FF generation on a kW to kW basis, I'd agree with you that this was a net improvement to environmental quality, but I don't see it happening. One may argue, and there may even be a degree of truth to it, that increased wind capacity has contributed to the delay or cancellation of plans to build FF burning plants, but I don't think any hard evidence for this exists. There's only one thing that a good treehugger should be advocating: conservation, powerdown. Conservation while still using grossly polluting energy sources is only half the equation. You need conservation and clean(er) energy sources. Only advocating half the solution while denigrating those who mostly advocate the other half is counterproductive. And honestly, wind, hydro, solar and nuclear have to my knowledge only replaced new FF generation capacity, though the old oil-fired plants are mostly gone now. Make me Boss & I'll order the shutdown of every coal fired power plant on day one, and the phase out of every NG burning plant within a year or two. Of course, I'll order the shut down of every nuke plant on day one likewise, and commence the takeout of every dam. "But what will we do for electricity," she cried?!? In the first place, we can do without about 7/8 of what we currently waste. For the remainder, we can go with PV on every existing rooftop in the nation and, yes! wind turbines designed so that they don't & can't kill flying verts. Such turbines may not be as "efficient" as those currently deployed but what good is efficiency of electricity generation at the expense of ecosystems and the vital services they provide? "You may say that I'm a dreamer, but I'm not the only one..."
I'd personally leave the nuclear in place, but I'm not afraid of radiation except in large quantities outside a containment. Fuel recycling is an absolute must, however. I'd probably leave well established hydro in place, as new ecosystems form both up and downstream of the dams, and the act of tearing down a 30 year old dam can be almost as destructive ecologically as the original act of putting it up was. A little distributed power and a lot of conservation would go a long way with that as a base. See? There's a lot of common ground & room for compromise when we agree to be reasonable. We probably need some type of rule that X number of new bat boxes need to be built (a suitable distance away) for every WT that is put up. Habitat destruction probably has a lot more to do with declining bat populations than WTs, but this would be one way to address that. Alas, you can not overwinter bats in boxes where it gets snowy. Good idea Observer. And I agree with you that habitat destruction is a much greater depressor of bat populations than wind turbines currently are, probably orders of magnitude so, at this point. My only point is that stressed populations don't need additional stressors, however trivial they may be, piled on top of preexisting stressors. The existence of worse things don't justify bad things. My only point is that stressed populations don't need additional stressors, however trivial they may be, piled on top of preexisting stressors. Looking out for all them creatures. The stress of cars arn't needed - yet you don't make regular posts on how cars kill critters like wind machines do. Biologically your wife should be dead, what with her diabetes. Yet, when you rail about electric toothbrushes and how the planet will be better off without the high tech, you never mention that high tech keeps her alive. You talk about the threats of man's actions on the planet - yet you bragged about how your genes will continue in your kids. So much for living the 'the earth needs less population' manta you state. Your nobility - we can all only hope one day to be as noble as you sir! The existence of worse things don't justify bad things. How very black and white of you. Perhaps one day you'll come into the real world and leave the world of AD&D Paladinship behind. Because here, in the real world, every watt from wind ends up being a watt less generated from burning fossil fuels, daming rivers, or splitting atoms - the 3 latter choices you've also derided. At least with a wind machine dead is dead - the whole biosphere isn't effected by radiation/mercury/CO2 like burning FF does. low level pesticide toxicity...habitat loss & hibernation disruption by researchers & spelunkers...mortality from wind turbines. You forgot to mention how cats are also to blame. As AGW increases the range of mosquito vectors of human disease northward, people are going to wish there were more bats. Electric trains & toothbrushes powered by the wind will be cold comfort to those suffering from West Nile virus or malarial infection. Bill Gates will save you. But really, there is only one way to address all them pesky human induced problems. Whether we know it or not, we have a strong and thriving voluntary extinction movement. The pro procreators and growth advocates just don't realize it yet. The pro procreators and growth advocates just don't realize it yet. In the week ending March 21, the advance figure for seasonally adjusted initial claims was 652,000, an increase of 8,000 from the previous week's revised figure of 644,000. The 4-week moving average was 649,000, a decrease of 1,000 from the previous week's revised average of 650,000. My unemployment checks have been on hold by the state because i have been unable to look for a job for the past couple of weeks, apparently they do not like the explanation i had a major surgical procedure and could not go out and look for a job. Want government assistance? Just say no to drugs. "Nobody's being forced into these assistance programs," said Craig Blair, a Republican in the West Virginia Legislature who has created a Web site — notwithmytaxdollars.com — that bears a bobble-headed likeness of himself advocating this position. "If so many jobs require random drug tests these days, why not these benefits?" LOL. darned if i do, darned if i don't. they prescribed a mild narcotic for the pain which i have been slowly weening myself off of by substituting with normal generic Tylenol. Right now i am also on a antibiotic for a infection of my sinuses caused by the fact that since i have stitches in my sinuses i could not blow the junk out. i think the fundamental requirement for drawing uic is that you are ready, willing and able to work. This is a report by Reuters. Matt Simmons is getting a lot more coverage lately than earlier. Matt sees prices recovering and going even higher than they did last year. I disagree with him on this point. Prices can only go that high if the economy recovers. In my opinion that is not going to happen. Oh things will recover slightly but dynamic growth in the economy is a thing of the past. It will never happen again. 20% decline rate is staggering. We know Cantarell is crashing, but that fast? And what about the decline rate in the other giants? Overall shouldn't it be more in the 5-8 % range? 20% decline rate is staggering. We know Cantarell is crashing, but that fast? Last year Cantarell output fell by one-third to an average of 1 million barrels a day, and stood at 772,000 barrels a day in January. Pemex still expects Cantarell to average 756,000 barrels a day this year thanks to increased investments in drilling and well maintenance. The EIA did not provide a specific estimate for Cantarell, but the International Energy Agency recently predicted average output at the field will sink to 600,000 barrels a day in 2009. They dropped by one third last year and the IEA expects them to drop another 22 percent over the next 11 months. (February thru December.) The 10% drop, predicted by the EIA, is for all Mexico not just Cantarell. And remember, historically the EIA's estimates have been way too conservative. Cantarell now produces less than 30 percent of Mexico's crude. He might also be thinking about maintenance issues. If the infrastructure is not maintained, then even if the oil is still in the ground it might not get pumped out as quickly as it could. About 5% was the situation last year. The decline could grow when many workovers, EOR and maintenance programs are canceled. I read that without these programs decline will reach about 10% on average. In some cases (decline percentages, oilprice) Simmons likes to give shocking information. Obviously he wants to wake up 'the world' in this way but it doesn't work. Although difficult to measure a decision to sharply decrease infield drilling is probably underway. Companies are going to choose to ride a field down instead of making major investments to keep marginal production rates higher. Also of course one reason for the relatively flat production levels for the last several years has been extraordinary in-field drilling campaigns similar to the US when it peaked. So one can expect the pullback to actually drop below "sustainable" maintenance. This is in contrast to the fact that the previous extreme campaign would have increased the depletion rate. These two effects are additive in that the net situation is that maintenance drilling will drop well below whats needed for the more depleted fields and the current well count will keep depletion higher for a bit. The net result is the estimate of a 10% natural decline rate in production is probably in error and it could well prove to be higher say 15% if I'm right about the double effect. Now its not going to decline overnight to 15% but I see no reason why global decline rates could not accelerate past 10% per annum. Now if you assume that peak oil production was in 2005 with a 10% natural decline rate increasing at about 1% a year you get a 13% decline rate in 2008 and a 14% in 2009. We assume that the excessive drilling campaign and new projects was able to cover say a 8% decline rate. Assume in 2009 this falls to say 6% this gives a net 8% decline rate thats increasing rapidly through the year as the infield drilling campaigns can be quickly wound down lets say it ends the year at 4%. Now the net supply/demand gap would have approached about 5mbd or so in 2008 maybe say 3-5mbd. This was eventually balanced by a economic crash at the end of 2008 reducing demand by say 4-8mbd creating a short term surplus of say 2mbd for at least 3 months. Now it does not matter if KSA played games with storing oil in the general case since if they withheld oil early to surge later it just would have sent oil prices up higher then predicted as they withheld some oil from a constrained market I'm not discussing prices in the scenario just trying to get a rough idea of how much extra oil hit the system and how long to pull it down. Now this is about 100 million barrels of oil or so maybe even is high as 200 million extra barrels where pumped before above ground cuts started. So now the question is how fast could this be drained down ? We can assume that the combination of production cuts and underlying increasing depletion rates have resulted in supply and demand to be balanced at this point the fact that oil prices have increased to the point that a obvious bottom has formed points to a balanced market. We still have probably at least 100 million extra barrels sitting in storage so this still distorts the actual price but thats a side issue. Lets guess that we are now at a 10% shortfall in supply vs demand the combination of cuts and increased decline rates. This is about 7mbd and suggest 14 days to draw down the excess inventory. Even if its as low as say 2mbd your only about 50 days away from drawing down inventory. You can play with the concept but if we really are in a rapid decline situation and balance has been reached in the last month or so then the current excess in inventory should drain down over a period of months and then we should go sharply negative. Now a lot of this oil is sitting in ships not onshore storage so a drain of floating storage is probably not going to be correctly interpreted at first it will show up as higher imports. I believe we are getting this signal now and this means that the drain down has probably started. So now the interesting question is watching how storage drains down globally if its going to drain down at all. A rapid draw down back into at least the five year average indicates that the underlying production has indeed worsened rapidly. Thus given the above assumptions you can watch the shape of the storage curve going forward and in my opinion it will tell you a lot about underlying fundamentals. If we see a rapid draw down of say six months or less with a steady price increase then I'll assert we are probably in fast decline for underlying production. I'm also assuming that demand will remain relatively flat at least until price increase above 100 a barrel so demand changes should be slow enough to not really change the outcome. And last but not least we have to have faith that the numbers will be messed up if we see a rapid change so we should see some strange TWIP reports start showing up with demand figures messed up as supply changes are incorrectly assigned etc. I'd not be surprised in the least for TWIP to show steady storage and a sharp increase in demand for example when in reality storage drained down and demand was flat its just reporting problems messed up the balance. In any case regardless rapid changes should cause abnormal reports. As I have noted before, I think that the Lower 48 and North Sea case histories are pretty compelling. Their average annual (net) decline over the first three years after peaking (after 1970 and 1999 respectively) was just slightly more than -1%/year, while their average (net) decline in the following six years was -5.3%/year (C+C, EIA). Simmons defines the gross decline as the decline from existing wells, while the net decline (or increase) is the decline after new wells, workovers, etc. Mathematically, the world was to 2005 as the North Sea was to 1999 as the Lower 48 was to 1970, with one key difference being that the world has been getting some contribution from unconventional production. I suspect that a sharper production decline, and especially a sharper net export decline, may be obscured by the decline in demand, but like Matt, I suspect that the decline in production and net exports will soon outpace the decline in demand. ..average annual (net) decline over the first three years after peaking.. was just slightly more than -1%/year, while their average (net) decline in the following six years was -5.3%/year.. The bobsled at the top of the hill gradually gains momentum as it begins its run down the slope. It seems we're at one of those points again, and I'm fine admitting I DON'T KNOW where the price will go. My brain tells me you're right, Ron. What I see around me is a system stressed to breaking, and in no way able to afford $150/barrel oil. The economy is barely getting along now - I think we've got a lot further down to go IMHO. We're in a slow rumbling collapse as it is; all sorts of systems would fail a lot quicker with higher oil prices. Airlines, trucking, car companies, most discretionary-spending dependent enterprise would fail. But I got stuck holding some oil and oil-service (non-US) stocks at the time of the price collapse. They were off 40 - 70% but have gained some ground recently. I'm just hoping for a little rally to sell them. I don't think they'll ever match their previous highs. When the system goes, everything goes. I don't see strong oil businesses and prices while the world collapses around us. I see diminished supply and shortages, sick companies (high cost of extraction), high oil prices, and economic decline all around. We can afford 150 dollar oil we can afford 400 dollar oil only at about 800 dollar a barrel or more is the real fabric of our oil based society threatened. Your mistaking a really really crappy situation with the end of the world. No the middle class would not be buying SUV's or 500k mcmansions at 150 dollar oil given our current economic level. In fact they won't be buying cars or houses period. Ones with a mortgage thats to high would default. Many airlines would also probably fail. Other than that I think you will be surprised at what we can and will pay for oil and how long and high it can go before we start seeing real infrastructural collapse. Every time a company thats overleveraged is forced out of business the remaining healthier companies get a boost in sales. The example is Best Buy and Circuit City. Best Buy saw a 10% boost in sales after Circuit City closed. High oil prices will work to forced overleveraged businesses into bankruptcy strengthening the remaining businesses directly and giving them a better ability to eventually pass on higher oil costs. Housing sales and new car sales can effectively go to zero. Credit card debt can be paid off or defaulted. In general most people can cut their housing costs by 50% vs having a mortgage. People that own their homes outright or have been paying a mortgage for a long time already pay less than rents. And we have a surplus of housing esp for strained economic times so rents can go down. Wages could easily fall by 50% in the upper half with no real problem again outside of housing,cars,credit cards. The bottom of the wage scale has a pretty hard floor with the minimum wage. Profit margins can be cut razor thin or slightly negative for companies with decent cash balances for years. This coupled with wage reductions means that production capacity can and will be scaled to meet demand. The only real hardship is you develop a persistent high level of unemployment and a growing poor population that has a substandard living level. All of this can happen in response to high oil prices well before the system itself reaches its intrinsic breaking point where energy costs simply make some goods to expensive for any market. As and example cheap figurines that have no use outside of decoration may simply cease to be made for the mass market. Lack of luxury is not the end of the world and indeed for most of us its not a lot different from the lifesytle we had growing up. I grew up in the 1970's you did not get presents except for Christmas and birth days and you got clothes and 1-2 expensive gifts and 2-3 smaller gifts. What I'm describing seems to be basically a return to living conditions in the 1970's and it generally was not that bad. This excludes of course the formation of a new underclass that has a hard time remaining employed. Anyone that has any sort of issue of any type which makes it hard for them to be a good employee is going to have a very hard time. Above this are people willing able and capable of working that find themselves sporadically employed and living on the edge. And above this are people with steady employment but forced to live in what we used to call slums but are the new lower middle class housing and under denser conditions. The working poor will be forced to return to the older more rundown housing. But at least for a while I just can't see things changing all that much from this sort of steady state situation as oil prices increase people will tighten their belts a bit more and you get a steady increase in the numbers at the bottom esp in he working poor category. At some point of course oil prices finally rise to the point that the wealthier but smaller middle class has to actually change its basic lifestyle and give up on the car. I'd argue that housing costs would have reached the point that further price declines don't help anyone before the middle class really has the change. So all oil prices do really is squeeze us to the point that its better to live in a reasonably cheap small apt probably with roomates and take public transit or other low oil usage alternatives. Once a non car lifestyle is actually better than one centered on a car we will change since having a car is no longer better than alternatives overall. And of course this finally means that oil prices would moderate. Now other factors may well cause collapse economic etc but intrinsically as far as I can tell this is the only reasonably direct result of rising oil prices. Now the combination of our current economic situation and rising oil prices probably will eventually result in effective collapse as the US is forced into default but thats not a pure oil price problem and how exactly this plays out is not known. However for the main economy as over leveraged companies fail the basic economy should be able to absorb high oil prices as people simply get poorer. Again it seems to me that it requires a combination of financial issues and high oil prices to actually cause systematic failure. I think our economy is in a box. As long as the economy goes downhill, oil prices can remain low. But if the economy starts to turn up, we will bump up against the peak oil ceiling, which will be a lower ceiling than it was in 2008. That would cause oil prices to rise with a vengeance and essentially knock the economy back down again. Matt sees prices recovering and going even higher than they did last year. I disagree with him on this point. Prices can only go that high if the economy recovers. Americans need to get away from the idea that they are the only ones that need to recover in order for demand to rise -this is not the 70s. There are literally Billions more consumers in the World than then and they all want a piece of the action. It's quite possible that America need only recover a bit before global demand comes roaring back spiking prices again. Since America has had essentially two decades reliance on cheap energy it is likely that it will indeed be hit harder and sustain more negative impacts from rises in the coming decades. At least Europe -with taxes- recirculates energy costs within its borders and this has also helped modify end user behaviour in what will probably prove to be a beneficial way (short/medium term). And now on to important items for Congress to be handling. Maybe they should have the selection for #1 college football team be done the same way as senatorial elections: raise tons of money, run tons of dirty campaign ads on TV. Works for them. Isn't that the way they already do it? Commercial real estate is going the way of residential real estate. The problem there is that real estate values are falling. Loans come up for refinancing every few years, and a lot of mortgages will not qualify for refinancing because the property values have fallen below the current mortgage value. Commercial real-estate loans are going sour at an accelerating pace, threatening to cause tens of billions of dollars in losses to banks already hurt by the housing downturn. . .
Of $154.5 billion of securitized commercial mortgages coming due between now and 2012, about two-thirds likely won't qualify for refinancing, Deutsche Bank predicts. Its estimate assumes declines in commercial-property values of 35% to 45% from the peak in 2007. That would exceed the price drops in the downturn of the early 1990s. The bank estimates the default rates on the $700 billion of commercial-mortgage-backed securities could hit at least 30%, and loss rates, which figure in the amounts recovered by lenders, could reach more than 10%, the peak seen in the early 1990s. Besides securities backed by commercial real-estate loans, about $524.5 billion of whole commercial mortgages held by U.S. banks and thrifts are expected to come due between this year and 2012. Nearly 50% wouldn't qualify for refinancing in a tight credit environment, as they exceed 90% of the property's value, estimates Matthew Anderson, partner at Foresight Analytics. Today, lenders generally won't loan over 65% of a commercial property's value. Why the seemingly inverse relationship between the delinquency rates of housing and commercial from 05-07? Coincidence? Our town center, the proverbial canary-in-coal-mine, has been boarded up since late 06. All four corners and then some are abandoned, incl. 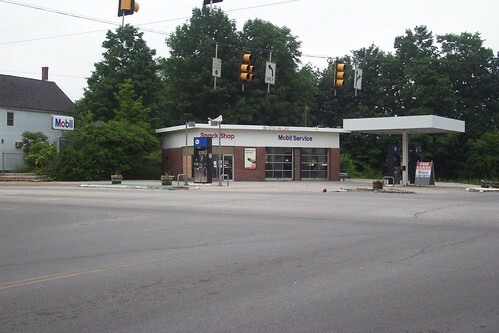 a Texaco station, a Mobil station, a private residence, a commercial property, an appliance dealer, and a nightclub. I can't resist posting these. I'm doing a photo essay of our town's decline, and the ugliness is simply compelling. 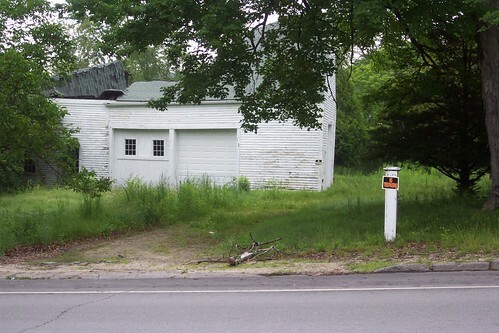 Higgins barn, collapsed since 07.
mikeB. These abandonned buildings, empty towns, and rutted roads have a certain kind of charm. I like walking through them and observing how nature slowly takes over and heals the wounds caused by our growth obsessed society. I hope to see more of this type of scene in the future. Hire bat biologists to figure out a way to induce bats & bees to live in these empty commercial sites so we can locally harvest the guano for O-NPK, plus the bee honey, and to protect these creatures. A BIG gold bullion bar = pint of golden honey! It strikes me that there is a limiting factor some where in there. Oh, and for the bats to opt to make it a hibernation site, the building would have to be heated and moisture levels raises. What happens to most of man's structures when the inside is moist? Bats fly at night, the bees during the day. And no bat would survive an attack of a swarm. Bees can do JUST fine with wood from a torn down building. Plenty of research has been done on bees, no need for more on 'how to use old building for bees.' Answer - tear it down and make a langstroth hive or a top bar hive. abandoned mcmansions would make good homes for bats. especially if there is an abandoned swimming pool half filled with water. The pool can provide a breeding ground for the mosquitos so the bats will get plenty of food. Lots of great potential locations in california, florida, and arizona. Credit card companies are suffering from record default rates. In the fourth quarter of 2008, credit card companies charged off – declared as uncollectible – a whopping 6.3 percent of their debt. Aside from a fluke spike in the data in the first quarter of 2002, this was the largest charge-off rate since the Federal Reserve began collecting these data in 1980. Residential mortgages and other loans related to single-family residential property. Complex securities like MBSs, CDOs, etc. overall [crude] inventories soaring to 16-year highs. Those high inventories are definite evidence of a shortage! I know the logic appears twisted but I am sure Gail can explain this seeming inconsistency. We're swimming it so much that it's still 50 dollars a barrel. When do they get desperate enough to really lower the price? Think Global Warming and Colder Winters. Same logic. I just did a google on "USA" and as it turns out we are NOT the only country on this globe.. It may be possble other countries also use oil? The average 30-year fixed mortgage rate dips to 5.19%, according to a report from Bankrate.com, the lowest rate since 1956. Home mortgage rates dropped to a 52-year low this week, according to a report released Thursday, in the wake of the government's announcement that it will buy more than $1 trillion in debt. To put the plunge in mortgage rates into perspective, 30-year fixed home mortgage rates averaged 6.77% in late October. At that time, a $200,000 home loan would have meant a monthly payment of $1,299.86. Now, with the mortgage rates down at 5.19%, the monthly payment for the same loan would be $1,096.99. That works out to a savings of more than $200 per month. The Federal Reserve said that it would buy an additional $750 billion in mortgage-backed securities and $300 billion of long-term Treasurys. The so called "quantitative easing" policy essentially increases the money supply and is designed to push interest rates down, making borrowing cheaper. So how does the government solve this bubble? Another bubble! Oddly enough Lizard that's how the Swiss solved their drug problem. Well...not actually the drug problem but the crime problem from drug use. Not only did they make drugs legal but also subsidize the cost. Last I heard a registered drug use could get a heroin hit for $6 as many times a day as they wanted. It achieved the goal: no more crime from addicts trying to pay for their high priced fixes. Granted, it only aided the decline in the lives of the addicted but the official Swiss policy was as long as they didn't bother the citizenry it was OK if it helped them ruin their own lives. With almost every solution to a serious problem there are winners and losers. The trick is to be on the beneficial side of the fence. Perhaps there’s some parallel logic there but I’m too tired to figure it out right now. That's a value judgment that only the individual can make for him- or herself. Government has no business making such a judgment for anyone, and any government that does so places no value on individual liberty and thereby has no legitimacy or claim on the fealty of its citizens. Oh Please! You're making your value judgements on people here every day.. what about MY fealty!? What they've done is apparently reduced violent crime stemming from drug sales. They made a complicated decision, and determined to help reduce violence, probably including innocent victims and deaths/danger for police in that equation, for the price of not necessarily improving the addiction problem. What do you want to bet they've got some similarly provocative programs for helping people deal with addiction as well? Outraged at another decision where priorities had to be delicately weighed.. familiar argument. What are you talking about jokuhl? I'm not saying anything about the policies of the Swiss government. I'm criticizing Rockman's value judgment about the effect of addiction on quality of life. I'm not even necessarily disagreeing with him, just saying that it's none of his, nor any government's business to pass judgment on the decisions of others to use drugs recreationally to the point of addiction. If you can't even follow what I'm saying you have no business commenting on my post. Somehow, that was unclear in your post. "Government has no business making such a judgment for anyone, and any government that does so places no value on individual liberty and thereby has no legitimacy or claim on the fealty of its citizens." Rockman simply said that 'their decline' as addicts being poisoned by their drug use .. that's a physiological decline .. was not being reversed or cured by this policy. I very often can't follow what you're really trying to say, but I don't think your cloudy arguments are any reason for my acquiescence..
"nor any government's business to pass judgment on the decisions of others to use drugs recreationally to the point of addiction.." .. and clearly, this policy has NOT 'judged users' for their addiction, but merely chosen to be the low-cost enablers of that habit, because they felt they COULD cast judgment on the violence that the Backdoor Marketing of Drugs had created. That's a pretty big step towards a 'Legalize It' solution. Perhaps there is a middle ground of legalizing production and distribution, but not consumption? Sounds odd, I know, but in general that's the opposite of what we have now, where "possession with intent to distribute" is worse than simple "possession", and wholesale trafficking is worse still. If you attack consumption from legal and treatment perspectives, especially if the usage is coupled with other crimes (theft, robbery, physical harm, gun violations, etc. ), then maybe it would drive usage down despite lower costs? I read an interesting book called 'Drug Crazy' a few years back, that outlined the failed Drug War, the massive expenditures, and the continued growth of the black market in drugs and in the Latin American Cartels, which had military budgets to challenge our own.. He compared it to Prohibition, and how much that policy managed to fuel organized crime in the US. I keep hearing 'Every action has an equal and opposite reaction' when I look at this question. And Maine is in the process of making it legal to grow Pot for medical use. We'll see.. I'm much more worried about Handgun Addiction than Marijuana Addiction. Sharing Hits is a much messier business.. Working gas in storage was 443 Bcf (12654 mcm) as of Monday, March 23, 2009, according to estimates. This represents a net decline of 44 Bcf (1269 mcm) from the previous week. Stocks were 300 Bcf (8553 mcm) lower than last year at this time. Storage increased in one area - the UK increased by 50mcm (1.8 Bcf)- this appears to be due to unusually warm weather last week and an increased rate of LNG imports. This is the first week this year where storage has declined at a rate similar to the same week last year. However there has been some unseasonably warm weather over parts of Europe recently and the decline in the same period last year was particularly large so it is too early to say whether the average rate of decline is slowing. We are also approaching the point where European storage should bottom out for the year so the next few week's figures need to be watched closely. You know, when I had the money for a down payment and went looking for property to buy, I chose a place that came with senior water rights and the potential to provide a sustainable supply of firewood. I wasn't rich at the time, and am even less rich now, but I found a place to live where I could grow food & keep warm without being (too) dependent on others. This isn't to say that I don't buy food in the grocery store or burn NG for hot water, but at least I have the potential to grow a good percentage of the food we consume and to do without NG altogether. I realize that if everyone did as I did such places as mine would become prohibitively expensive to people like me. I don't want to come off as overly smug & cold-hearted but it's difficult for me to be very sympathetic with people who choose to live in apartment buildings utterly dependent on NG supplied by foreign nations not particularly sensitive to their needs, to keep from freezing. Nor do I feel much sympathy for those underwater with ARMs. I took out a 15 yr. fixed rate mortgage & paid the damn thing off. Guess I should have just waited for a bailout. My point is that for hundreds of millions of people to be living in situations where they are utterly dependent on others for all the necessities of life, is just plain stupid, and that these people will have no one to blame but themselves for being among the first to die when those necessities are cut off from them. It seemed like a good idea at the time, and the first taste was probably free. But never mind, gramps, I'll get off your lawn now. The Foreign Ministry said Thursday that it saw a pledge by the European Union to help modernize Ukraine's gas infrastructure as "an unfriendly act" against Moscow, following a similar warning by Gazprom. Brussels signed a cooperation agreement with Ukraine on modernizing the system this week, but Russia was angry that it was excluded from the talks. "What happened in Brussels ... at the forum was an unfriendly act in relation to Russia by both the European Union and Ukraine," foreign ministry spokesman Andrei Nesterenko told a news conference. Prime Minister Vladimir Putin has threatened to review ties with the EU if Moscow's interests are ignored. Gazprom said late Wednesday that any changes to Ukraine's pipelines would need the company's approval or risk disrupting gas production and output across Eurasia. "Unapproved change ... will immediately affect not only export supplies but also the production process of Russian and Central Asian gas and may entail unpredictable consequences for the whole Eurasian territory," Oleg Aksyutin, head of Gazprom's transportation department, said in a statement. One wonders what the EU is up to going behind Moscow's back here and what possible gain there might be? Certainly seems a lot to lose. KIEV, March 26 (RIA Novosti) - The recent Ukraine-EU natural gas pipeline declaration does not make any sense and looks like a deal signed by "a deaf man and a blind man," the Russian ambassador in Ukraine said Thursday. Ukraine and the European Union signed a declaration on Monday to modernize the ex-Soviet state's natural gas pipeline network. Russia, which transits about 80% of its Europe-bound gas via Ukraine, said it was excluded from the talks in Brussels, and Prime Minister Vladimir Putin threatened to review ties with the EU. "If you want my opinion, it looks as if a deaf man and a blind man sat at a table and signed the paper without even understanding what they had signed," the UNIAN news agency quoted Viktor Chernomyrdin as saying. "Amsterdam launches ambitious electric cars scheme"
Amsterdam wants all cars in the city to be electric by 2040. The 'Amsterdam Electric' scheme was launched on Wednesday by the city's environment alderman Marijke Vos, in a bid to cut exhaust emissions. The goal is to have 200,000 battery-driven vehicles in Amsterdam in 30 years' time. What would happen to the Netherlands if, in 2030, the sea level starts to rise and eventually, after 100 years, leads to a sea level of five meters above current level? Two scenarios are developed from literature and primary research through eliciting opinions of professionals in the domains of social sciences, economics, civil engineering, and land use planning. One scenario describes what would happen in a future characterised by a trend towards further globalisation, marketisation and high economic growth, while the other scenario happens in a future under opposite trends. Both scenarios indicate that the Southwest and Northwest of the Netherlands would be abandoned after the sea level rise. Although most experts believe it is geo-morphologically and engineering-wise possible to largely maintain the territorial integrity of the Netherlands, there are some reasons to think that such is not likely to happen. The costs of such works would be enormous, annually a few percents of GDP. For some parts of the Netherlands, these costs would greatly exceed the avoided (local) damage costs. Decision making, therefore, would have major political implications, and would come late since social processes – e.g. the belief in the reality of SLR, the framing of such decision in a proper political context (policy window) - that precede important political decisions occur slowly. Although, the chance event of a flood disaster would speed up such processes, the general expectation is that decisions would come to late vis-à-vis the rate of SLR and the possible rate of construction of works. There was a natural gas injection of 3 Bcf this past week, ending last Friday. For the past five years the average for that week has been a withdrawal of 49 Bcf. LNG shipments arriving as large scale liquefication projects are completed. Shale gas wells completed with over 20 mmcf IP. Pinedale Anticline production from tight sands in Wyoming; one of the hottest natural gas plays in the lower 48. New gas pipeline (midstream) infrastructure being completed to bring stranded gas to market. Legacy gas production from low production wells that produce for 30-50 years on shallow decline curves. Economically effected residential consumers and businesses cutting back. Springtime warming to curtail heating fuel needs. Do you have any sources for stating the LNG shipments are increasing? Natural Gas consumption began tumbling in late 2008 as General Motors and Dow Chemicals shuttered plants amid a drop in demand for their products. The contraction in the US economy may drive down gas use by factories and petrochemical makers by 5.1% in 2009, the Energy Department said in its monthly Short-Term Energy Outlook on February 10. Barclays Capital expects that the global LNG market will add 5.6 Bcf production capacity a day to the 23 Bcf a day currently online. However, most new LNG capacity from Russia and Indonesia is already slated to go to Japan, Korea, India and China while new production from the Middle East and possibly Nigeria is likely to be taken by Western Europe to offset unreliable natural gas supply from Russia. Excess LNG global capacity would also have to be imported to the US at below cost given the current low US natural gas prices of $3.86/mcf. Pity there's no transatlantic gas pipeline... Either that or the US could send all its idled gas drilling rigs to Gazprom. Still US production should start to decline again soon and we'll see if demand destruction outpaces production drop. I doubt Gazprom would take the rigs Undertow. A friend working for a domestic rig builder (just like the one Gazprom would use) has shut down. Their last market to collapse was the former Soviet block. From what I've read lately there's no need for a transatlantic p/l. There are at least 46 LNG tankers sitting idle that can had for a transport cost of $1/mcf or less. Add that to $1 to $2 cost to liquefy the LNG and the completion of a number of major LNG plants in some very large stranded NG fields around the world. It might take a great deal of demand CONSTRUCTION in the US before we see much recovery in domestic NG prices IMO. Gail’s post regarding the potential meltdown in US commercial mortgages does not bode too well for that to happen anytime soon. US NG production is dropping right now. But the fear of the potential for significant LNG imports is holding back domestic drilling just as much as the current low prices and continued recession fears IMO. It will be interesting when NG prices do rebound, could be a heck of a bounce. Without its two major mega projects (Yamal Peninsula and Schtockman) Gazprom and other Russian producers need to drill like mad in smaller fields and rework some existing to even attempt to offset the decline of their supergiants. It looks as if they got way behind the curve and cutting back even further on drilling now would seem to be a disaster in the making. Without Russian Gas there is not enough reverse flow capacity in the european transmission network (or worldwide spare LNG capacity to feed it) to make up the difference. Now obviously Europe still has Russian gas (just not in previous quantities) - the question is will there be enough import capacity and reverse network capacity to make up for whatever shortfall there might be? The UK should be ok next winter assuming cargoes arrive. Not so sure about other parts of Europe. withdrawal for the same week in 2008. Bloomberg: Withdrawals of 8 to 12 Bcf for the week, or 1.1 to 1.7 Bcf/d. 2008: Withdrawals of 36 Bcf for the week, or 5.1 Bcf/d. 5 yr. avg. : Withdrawals of 49 Bcf for the week, or 7.0 Bcf/d. So everyone was expecting small withdrawals. The actual result was a small add. Probably worth noting the expectations and actual are within the weekly estimates error range. Based on a comparison of weekly estimates and monthly data from May 2002 through December 2008, estimated total working gas stocks have exhibited an average absolute error of 18 billion cubic feet, or 0.8 percent. Still - these are small differences of 10-15 bcf - but perception is reality (in the short run). In the long run reality is reality. If only we had some storage to fill up. Maybe we can use old coal mines filled with biochar as adsorbed natural gas storage? Bit of an explosive risk though. The national average passed $2 this morning, as AAA reports. My local station is up $.10 in under a week. Sub $2 seems to be over with here. Major research organisations have found that over the long term, there is vast potential for sustainably produced bioenergy. Scientists working for the IEA's Bioenergy Task 40 put it at a maximum of around 1300 Exajoules by 2050 (current global fossil fuel use is around 380Ej per year). This biomass potential is explicitly based on a 'no deforestation' scenario and on the fact that all food, fiber and fodder needs of growing populations and livestock must be met first. BTW where did the 'third generation' biofuels go ? Did I miss out on this completely ? Finally : I've had it with IEA, their cred is gone to ZERO with me. Also look at the Dave Cohen article I posted, talking about Steven Chu's similar crazy ideas. actually I got this info from a sub-link via Dave Cohen's brilliant article, thanks a lot! Dave understands the limitations of bio and make a strong case where as Chu on the contrary freaks me very much out ... with his touch on Thermodynamics. Woo-hoo! Let's replant the entire Amazon and Congo basins in palm oil! And just think of the JOBS it will create! Yee-hah! I wrote it for people like you. Hi Dave, you do a really great job in spreading the message. Kudos. That said I don't feel I am in your target group, those who should be converted so to speak. I'm well PO aware and quite sceptical to all sorts of renewables due to Eroei, Liebig-minimum and time/area-related limitations.And not the least : lack of pace concerning them thermodynamical processes. The continued push for biofuels confuses me photosynthesis converts about 2% of the sunlight to plant material, and using the biomass in any sort of heat engine yields conversion losses. Focus the attention on conversion of sunlight to electricity. Is a 10% conversion efficiency for CSP realistic? I heard the number used somewhere. With improvements in materials the reflection and adsorbtion could be maximised and a higher temperature steam cycle could be used. More solar power will also help flatten the day / night load cycle, and the synergy of CSP and combined cycle natural gas plants will help the evolution of the technology. Perhaps even CSP with a small amount of coal burn to boost the steam cycle up to supercritical temperatures? In addition you don't have to roll out a whole new fleet of vehicles that have enormous sunk costs. We view yesterday's DOE report as neutral. The crude stockbuild is bearish. The gasoline draw, supported by an uptick in implied demand vs. the prior week, offers some support, but the actual weekly decline in mogas stocks is smaller than is typically the case during the peak of spring turnaround season. Distillate fundamentals remain poor. Gasoline stocks fell by 1.1 million barrels to 215 million barrels. Stocks are in line with the 5-yr historical average, and below last year s levels. We think it s hard to get overly excited about a gasoline stockdraw during the month of March, when mogas stocks have historically fallen by ~2.5million barrels/week, but the mogas stats are more supportive than distillate. Implied gasoline demand picked up from the prior week by145,000 bpd, averaging 9.1 mbpd. DOE-reported 4 week trailing average implied mogas demand is up 0.7% y-y. Mogas imports remain high at 1.14mbpd. We are waiting to see if the collapse in MR product carrier rates over the past few weeks heralds a decline in transatlantic mogas volumes. Distillate stocks fell by 1.6 million barrels to 144 million barrels, but remain over 30 million barrels higher than the 5-yr average or last year's stocklevel. We have noticed a recent uptick in distillate imports, likely a result of high global distillate stocks; in fact, market sources indicate the distillate is now being storage on LR carriers, much like crude on VLCCs. 4 week trailing average implied distillate demand is down a reported 9% y-y. Crude stocks rose by 3.3 million barrels, and SPR crude stocks increased by an additional 1.8 million barrels. Cushing stocks fell 2.2 million barrels to 31.7 million. We have been of the opinion that the crude market would approach a more balanced position as refiners increased runs following an end to turnaround season, but with reports of lengthened refinery maintenance/elective run cuts proliferating (including Valero at Del City and Total Port Arthur in the past week), we think the crude market may take some time longer to reach equilibrium. Also of note is the DOE s estimate of domestic crude production, which still shows the impact of last year s drilling activity and a few large GOM project start-ups; reported U.S. Crude supply is up 330,000 bpd, or 6%, y-y. I do grant the possibility that constraints on primary production were the result of an “accident” (mere chance) in the way life evolved on Earth. Every event in evolutionary history has been an "accident." This doesn't mean that events are the result of "mere chance," however, since what's possible is constrained by physics & what's already available for selection to work with. Selection is mindless & seldom "creates" innovations de novo. Rather, selection tinkers around with what's already there, modifying, exapting, jury rigging structures & enzymatic pathways for new functions. Thus, organisms often seem inefficient, poorly engineered, clunky, compared to the products of rational design. It's easy to see how a technocopian idealist lacking in wisdom, such as Chu, can arrive at the conclusion that the genomes of organisms and agroecosystems can be "improved" upon in order to better suit human needs. Yet no artifice of human manufacture comes close to matching the efficiency of the mitochondrion, no dialysis machine cleans the blood of metabolic wastes as well as a kidney, etc. Many who objected to Obama's choices for fiscal advisers & Treasury secretary considered the choice of Chu as one of his better picks. This hubristic plan "to achieve greater efficiency in the conversion of sunlight to chemical energy" just goes to show that Chu was as poor a choice as Geithner, and that Obama is indeed an idiot. Many Latin American leaders, including Lula da Silva, smell a rat in what they believe to be the hyping of the situation in Mexico by U.S. media and the Obama administration. President Bill Clinton proclaims that "protecting our people, our territory, our way of life" are the objectives of U.S. national security policy, goals that are to be advanced "through engagement and enlargement"--NAFTA and drug control are listed as two key elements of such "engagement and enlargement." "U.S. National Security is a global strategic doctrine, relative to maintaining economic, political and military supremacy in its zone of influence" is how Mexican politilogue Adolfo Aguilar Zinser defines these same policies. Mexican president Felipe Calderon has fired back, denouncing a "chain" of U.S. media and administration pronouncements as a "campaign" to demonize Mexico and portray it as a "failed state." Yesterday he and other top Mexican officials issued statements that U.S. soldiers would not be allowed to operate on Mexican soil. Lula da Silva joined the foray earlier this week warning Obama "not to intervene" in Latin American affairs. San Jose.--The president of Costa Rica, Oscar Arias Sanchez, blasted the United States for the lack of consistency of the White House between its "huge preoccupation" over the drugs produced in Latin America and the Carribean that "poison" the American people and the "reduced" resources Washington allocates to Mexico and Central America to fight against the cartels and international drug trafficking. I will be indiscreet. During a dinner with President Bill Clinton that I attended last August on Martha's Vineyard, Grabriel Garcia Marquez forcefully presented his Colombian homeland's argument. Why is drug supply prosecuted so vigorously and demand so leniently? Who in the United States is receiving drugs from Colombia, laundering the money, marketing drugs every day to 30 million U.S. citizens, bribing lawyers, the police, and politicians? There must be U.S. drug barons far more powerful than any Colombian trafficker. But the people who are dying are those fighting them in Colombia, not in the United States. Most leaders in Latin America would welcome a return to FDR's "Good Neighbor" policy. Obama, however, seems intent upon preserving the status quo, and in so doing may drive Brazil and other Latin American countries into the waiting arms of OPEC, China or Russia. Obama, however, seems intent upon preserving the status quo..
That's the job he was selected for. Fact that the status quo is unsustainable is why such a persuasive charismatic guy needed to be selected for the job of selling the illusion that it can be sustained. All this diplomatic posturing is probably little more than political theater. One has to remember that these Latin American leaders are just as perfidious and duplicitous as their U.S. homologies. But it appears they have been emboldened. The mystique of the U.S.--its perceived ability to project economic and military power around the globe--has suffered greatly due to the Iraq debacle and the financial crisis. It's a sign of weakness, and these Latin American leaders are sure to exploit it to gain greater sovereignty and more independence from the United States. Aafter all, it's great to be able to entertain offers not only from the U.S., but China and other countries as well for your oil and other national products. Will the U.S. be able to reassert dominion over Latin America? In this I'm in agreement with you. I think that not only are the chances of that very slim, but the United States' grip on the region will grow progressively weaker. LATAM leaders have the interests of their own power elites to look after, same as Obama has, as you say. But it isn't about them being "emboldened" by the Iraq debacle & financial crisis - it's about legitimate outrage over "Monroe Doctrine" meddling in the internal affairs of sovereign nations by a greedy bully to the north. Laying off the bullying & being a better hemispheric neighbor isn't about "weakness." It's about cooperation for mutual benefit. Let's hope that the US can't and doesn't even want to reassert dominion over LATAM. We need to be friends with our southern neighbors, not their overlords. If they can make better deals with the Chinese or anyone else than they can with the US, more power to 'em. Well I don't know what in the hell is going on. During her flight towards Mexico City, the secretary of State said that the efforts of the United States to prohibit drugs and avoid their consumption by its citizens clearly has not been successful and that it was unfair to blame Mexico for the war of the drug lords. Later, during a press conference together with the secretary of Foreign Relations, Patricia Espinosa, Clinton assured: "I don't think that there exist ungovernable territories in Mexico...."
In regard to that, after a wave of statements by U.S. functionaries that cast Mexico as a "failed state" and that the government of Calderon had lost control of some territory, Clinton settled the controversy by indicating that there is no ungovernability. "I don't think there exists any ungovernable zones in Mexico," she said in the conference. The secretary of State, Hillary Clinton, admitted yesterday here, on Mexican soil, that the "insatiable" demand for drugs in the United States and the sale of arms from that side of the border are the causes of the spilling of blood in Mexico by the drug cartels. It was a self-critical speech the likes of which has never been heard before from a high-level U.S. functionary. Obama will be here the 16 & 17 of April. Obama seems less persuasive and charismatic all the time. I wonder what he really thinks after all -- surely the POTUS is aware of the ecological tsunami approaching, as well as the ongoing last resource war. I watched "Extreme Ice" on PBS the other night with my young son -- after watching a program like that related to the cryosphere one cannot help but become more aware that the world is a desperate place as far too many people compete for far too few resources within what is for us a rapidly deteriorating habitat. Surely the POTUS is aware that we are in for a massive die-off of humans. My own guess is that behind the scenes a completely different discussion is going on within most world governments: a discussion about survival for some remnant of humanity. I think that much of the public discourse we see is simply a matter of distraction. The masses have been useful for keeping the great engines of the economy running. Shortly the masses will be a burden, and will need to be managed with more brute force -- starvation, thirst, lack of shelter or medicines -- these will actually be instruments of control. Those who are compliant and useful will have some measure of necessities, while others will be left outside to die off, if not criminalized and enslaved or killed off. Our population will be culled dramatically over the next couple of decades. The elite have a task of trying to manage that culling to exclude themselves, do they not? Maybe I am just too cynical about the dis-info-tain-ment bubble we are wrapped in.....? Very insightful post beggar. It's hard to tell how much Obama & other so-called "leaders" are aware of, behind the public facade they affect. Sometimes it seems that they must be aware & actively planning for the contingencies you outline. Other times it seems that they're truly as clueless as they appear to be, and actually believe the BS they spout. To my mind, you aren't cynical at all. You just strike me as being someone with a pretty clear overview of the reality of the situation we face. Does Obama et al., have an equally clear overview? Who knows? Does Obama et al., have an equally clear overview? Who knows? I wonder a lot about this DD, probably more than I should because it warps my brain. I, like many here, do not see a viable solution and the implications are grave indeed. On one hand, I don't see how they could possibly not know, and yet I don't underestimate hubris and denial. Assuming that they do know can take one down the road to tin-foil hat territory pretty quickly. I suspect, and fear, that we will only know the true story after the fact. There is a very short distance from the Doom-monger to the Warmonger. The real problem here is the overpowering culture of Fear in the American psyche, Fear that stems from the Gun culture, and from the worship of Money and the Rich and is constantly stoked by the Media. Only the Anglo-Saxons would approve of somebody like Soros and people like him, and hang on their every opinion and move. I can point out that other cultures have studied you, with interesting results, although the language barrier limits the spread of their opinions. Vicente Verdú's El Planeta Americano, from an economist and La Sorbonne PhD is an important essay http://en.wikipedia.org/wiki/Vicente_Verd%C3%BA. The Economist, very resentful at his opinions, breathing through the wounds, and knowing that it was a bestseller, in a review of European works said that "the Spanish go for pointy-headed essays." If you want to read El Planeta Americano, it will have to be in the original Spanish -not the most difficult language in the world. I don't think it will ever be translated into English: The last chapter is entitled How to Impede that the world turns into The American Planet. It will amuse you that the first book of Verdú was "If you don't give presents, they will assassinate you". It was instantly retired from circulation by Franco's censors! This reminds me of a recent documentary on Norse Greenland. When the climate changed, the colony failed. One of the historians on the show noted that "the rich bought themselves the right to die last." You seem to like Mexico, but when the majority of the country's government and land is under the control of drug lords rather then non corrupt government officials it means it's a failed state. Who was the fellow who tried repeatedly to blow the whistle on Madoff, only to be ignored and shunned by the SEC? And what about the retaliation often meted out to whistle-blowers in the U.S.? How different is that from this? PGR offers millionaire rewards for "capos"
...the professor-investigator from the Instituto Nacional de Ciencias Penales, Martin Barron Cruz, considers that the greatest risk of the reward scheme is the potential for leaks that could jeopardize the lives of the informants. "It's perhaps where the program has the most to overcome, because the Mexican society doesn't trust the authorities... If there is someone who wants to provide information, that person never knows if the drug capo is in collusion with the police or the prosecutors." And you really believe the U.S. is any different? CHIHUAHUA, Chih.-- A group of 20 armed men liberated a prisoner convicted of drug trafficking from a private hospital where he was being treated for a heart ailment early Tuesday morning. Crispin Humberto Borunda Cardenas, capo formerly linked to the Juarez cartel, was waiting extradition to the United States. In 1998 he escaped from the La Tuna maximum security prison located in Anthony, New Mexico, located 12 miles from the Mexican border. Hum. He escaped from a maximum security federal prison in the United States. Could that have happened without the help of prison officials? Is the U.S. fully under the control of the guys in white hats? For some convicts a "Wanted: Dead or Alive" poster would seem to be warranted. I assume the hospital guards were complicit, else surely they could have at least shot the prisoner while "attempting to escape". Not a news item to be found. Prison breaks like this of course don't occur in the United States, only in Mexico. I haven't been to Mexico in over a decade but I used to go there several times per year and tended to really like the people and have a good time there. Perhaps things have changed, given all the recent publicity about the drug violence. I'm not sure. But I suspect that the violence is pretty much confined to the border cities & towns and la frontera has always been considerably more squalid than the "real" Mexico further south. In fact, many US citizens who have a poor opinion of Mexico are only familiar with places like Tijuana or Ciudad Juarez. I don't think there's ever been a time in recent Mexican history when the government hasn't been corrupt and bought off by the drug cartels. It's the US "war on drugs" policy that's to blame for all the violence, after all. The Mexican people tend to bitterly resent US hypocrisy in this regard. For Hillary Clinton to admit that US demand for drugs & supply of weapons contributes to the violence is a step in the right direction, but she needs to be completely honest and admit that the real problem is with the failed US policy of prohibition. if you haven't already read it, b. traven's "treasure of the sierra madre" and the bogey movie, same name, are highly recommended. there is a documentary included with the dvd. GDP hadn't fallen so much since the first quarter of 1982. It was the third largest decline in GDP in 50 years. "Big Oil Snapping Up Western Water Rights"
"Six major oil companies have purchased rights to billions of gallons of water in the West, potentially jeopardizing water supplies throughout the region, a new report by Western Resources Advocates, an environmental group, indicates. " Let's see....shale oil sucking water from the SW.....ethanol taking water and land from the midwest....and CA already falling short for farming. ..In the 1990s and early 2000s, developers built 5,000 golf courses, bringing the country's total to 16,000 courses. ..numbers from the National Golf Foundation show a 9.8 percent decline in the number of rounds played locally from 2007 to 2008. ..Fixed operating expenses mean any drop in customers can devastate a course's bottom line. It costs the same to run a course whether you have one duffer or 10,000, so even a 5 percent drop in rounds played can wipe out a club's profit, Hegarty said. Rising water prices have tightened the pinch on local courses, too. .."It's incredible how empty the courses are," he said. .."I've been in the business for 35 years, a golf pro for 35 years, all the other times we've had a downturn in the economy the golf business was real good, at least our golf business was," said Jack Seltzer, general manager and club pro for Bay Dunes Golf Course. "This one's different. This one's real different. "People are more scared. More people are out of work. People are really scared to spend money. Almost everybody I talked to within the PGA said that's what's happening." I wonder if 5-10% of 16,000, or 800 to 1600 golf courses will close this year? The Bluffs golf course, club house and pro shop, driving range, chapel, tennis courts and swimming pools are listed for $6.5 million. An undeveloped 118-acre tract already approved for planned-unit development for $1.775 million. Another undeveloped 138-acre tract for $1.35 million. And The Bluffs’ new clubhouse building for just under $5 million. Ortte said the sellers also are offering the main golf course components and the 118-acre and 138-acre tracts as a package for $9.35 million. Perhaps some wealthy farmer [Richard Rainwater?] will probably buy this entire operation for less than $100,000 a couple years from now. How many tons of food can one grow on a converted golf course? Some more thinking: any farming equipment, plus seeds and I-NPK could be stored in the gutted clubhouse [I would save the bar & liquor!] and other gutted buildings. The swimming pools could be converted to catfish farms, and the already-fenced tennis courts could have chicken coops. The farmer will, of course, only trade for Real Assets: you better bring him some mature compost [O-NPK], a bag of I-NPK, a good set of hand wrenches, sturdy boots, toilet paper, medicine, bullets, a prized book, firewood, water-purification tablets, etc. He won't be interested in trading for Precious Metals [PMs], a big screen tv, a video gameplayer, etc. Another thought: if most of these golf courses go belly up there could be a tens of thousands of golf carts for sale soon. No need to buy a Chevy Volt: just keep your present vehicle for the longer trips, but buy a cheap, used golf carts for any medium-distance runs, with a bicycle for the shortest runs. EDIT: google gun or ammo sales if you get the chance-->Through the Roof! After all the Death threats to AIG and other finance topdogs: I guarantee you that they are now learning to shoot bullets at gun ranges instead of teeing off a bucket of balls at a golf range. I wonder how many Club Cars there are in the US? That might be a start on an EV Fleet right there, huh? I think I'm still aiming for a version light enough to pedal and have some Electric onboard.. but I'd probably jump if these were being liquidated by bankrupt Country Clubs.. I was just at a grocery store, and as my wife generally does the shopping, I was really reminded of just how crazy-bountiful (spoken with a wince) we have been living in this country. How many people around the Globe would just Swoon to be surrounded by that much food? There was some sports drink with I think Jack Nicklaus on the Labelling.. Sports Drinks for Duffers! I thought of you. My girls are in Glendale right now with my father-in-law. One of these days, we'll sneak a 'snack-pak' of NPK onto your porch, in gratitude for your fine and wild ideas! Thxs for responding. If my Asphaltistan's Taliban leadership was proactively smart [they are not! ], they would seek to buy every used golf cart they could that came up for sale across the country. It would then be a snap to yank the tires, install steel wheels, then use these 10,000 as mini-electric locomotives to pull 3 or 4 10-passenger mini-railcars on quickly installed narrow gauge SpiderWebRiding track. Snow and ice is not a problem here in Phoenix, but once US regional ELM kicks in I expect TX and CA to cutoff our fuel PDQ. Our hydrodams and Palo Verde Nuke plant could easily recharge all these 'golf cart locomotives'. Golf Carts of 36VDC or 48VDC can be connected to PV through a voltage regulator so your Asphalistan Express can be solar powered. Typical range is 10 miles (no solar) which is 2 18 hole rounds without charging. Since I run my cart with only one person most of the time, I can pull a pretty good sized trailer (~600#) but I think two or three passenger cars with six or eight people going up South Mountain would too much load for the motor. Of course you can get a DC motor that will make the cart do a wheelie but it takes a lot of battery. As you probably already know: the Valley of the Sun is generally pretty flat overall, thus it is hard for me to see much reason to run any tracks up our steep mountains. Converted used golf carts, mini-passenger railcars or freightcars pulled behind, and practically zero maintenance track, could be much cheaper than buying thousands of rubber-tired buses & trucks plus repaving all the roads so they are not quickly hammered to death by potholes. We just need something cheap & quick & narrow-gauge workable as a 'ribcage' to help support the standard gauge 'spine & limb' build-out of Alan Drake's RR & TOD ideas. Once FF-depletion really kicks in and we can't even keep these golf cart locos running: then we necessarily switch to pedaling rail bikes as the next downgrade step of Optimal Overshoot Decline. EDIT: some for idea clarification. In 2011, Hamburg will become the second city to earn the title of Europe's "Green Capital." In keeping with its eco-aspirations, the German port city is backing hydrogen and fuel-cell powered cars. And it has big plans. In cooperation with companies like Daimler, Shell, Total and Vattenfall, the city wants to accelerate its drive towards the new technology. Starting in 2010, the city (and state) of Hamburg has pledged €2.25 million ($3.06 million) to support the plan. Daimler's Chief Executive Dieter Zetsche, meanwhile, said his company would invest "a double-digit million euro sum." The energy company Vattenfall says it will continue to produce the new fuel using renewable energy sources, especially wind power. But the question remains: When will hydrogen-fueled cars be mass-produced and affordable? Zetsche says that annual production of the new vehicles would have to reach 100,000 and that by around 2015, the vehicle prices could match those of conventional cars. On the other hand, solar powered trash-cans seem to be viable already. "Yet nobody seems to ask the question, Where are we going to get 10,000 or 20,000 square miles of desert to do all this? The assumption – much like that of the early American pioneers – is that there are vast tracts of land somewhere out there in the West waiting to be put to our use. Has anybody ever heard the term “environmental impact?” Is it even conceivable that you can mark off this much land on the map and not come across some endangered species? Here’s another consideration that you never hear about. One of the biggest problems with solar mirrors and photovoltaic panels is they get covered with dust and grim and lose much of their effectiveness. They have to be washed off frequently. Where, in the middle of the desert, do you find enough water to wash down 10,000 square miles of solar collectors at least once a month?" I think that, one, we aren't going to build solar panels for 100% of our energy until we don't have to build 10,000 sqm of them, and two, calm down. We need energy and if it comes at a cost of a few endangered species, SO BE IT. You're arguments are blasphemous and I really don't know where to begin with. One more thing, why the hell do you think we're just going to switch directly from conventional to solar over night. These things take time, and just like the first computer was as big as my house, solar panels are still new and will develop so that your stupid idea of building 10,000 sqm of panels will change into building 100 sqm. What is wrong with these people, they can only see what is right infront of their faces. Global systemic problems like global warming, have no effect on their little minds! Easier than you think. First, at 15% efficiency 1km2 of panels generates 1000MWh/d, or say 400,000MWh/y, in the US southwest. Total US generation is 4B MWh/y, so we only need 10,000 km2 or 4000 mi2. However, if we only choose to replace coal powered electricity in, say, half the country we only need a paltry 1000 mi2, or a square 31 miles on a side. If you ever drive through the southwest you will notice that there is a lot of empty land, surely the varmints can spare that little bit. Matt Simmons has become more pessimistic in this March 16 presentation. 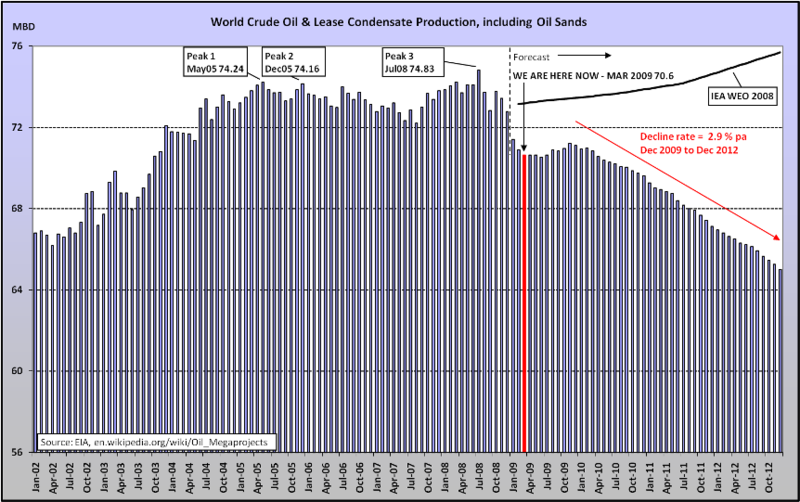 The excerpt below shows crude and condensate (excluding oil sands) declining sharply by the end of 2010. In comparison, my forecast of crude and condensate (adjusted to exclude oil sands) is 68.1 mbd in December 2010. The chart below includes oil sands. My forecast is 1.6 mbd higher than Simmons' likely case mainly because my forecasts for these countries in December 2010 are higher by these amounts: Saudi Arabia, 0.7 mbd; Iraq, 0.6 mbd; and Venezuela, 0.2 mbd. opec is already down to 28mb/d per iea... over the near term this value depends on price. I doubt that non-opec will fall anything like what simmons is predicting for the 'likely' case, a decline of 4%/y. One question is, when will opec bring back the 3.2mb/d currently off line? Presumable if and when price goes above 75, the saudi target. So, if you think the slide in your table will bring about higher prices, then you should assume all of this flow comes back. For the future, IMO it makes sense to develop a case in which tar sands production ramps up much more rapidly on account of recent THAI progress. A very appealing point is that each 10k/d module is a modest 150m capital cost, so 1Mb/d is a paltry 15B. Maybe no affect over the next three years, but maybe rapid expansion after that... the majors have plenty of cash and nowhere else to go, and meanwhile costs are falling fast. "....then you should assume all of this flow comes back." bad assumption. every barrel produced will reduce "capacity" by a small amount. thai process, despite the rosy projections, is not a proven technology. the promoters apparently want the "investors" to think that combustion will occur perfectly uniformly and that all the difficulties previously experienced with combustion processes have been or will be easily solved. 1) in situ combustion tends to have poor vertical comformance. thai is an improvement. 2) heat loss (fuel consumption) represents a significant part of the bitumen in place. 4) mineral scale and corrosion problems throughout the system. 6) precipitation of waxes, asphaltines, and carbon due to thermal cracking of the bitumen. 7) production of hazardous gases such as hydrogen sulphide and carbon monoxide. thai may prove to be economical, but $ 15k/bpd ???? imo, a reality check is called for.